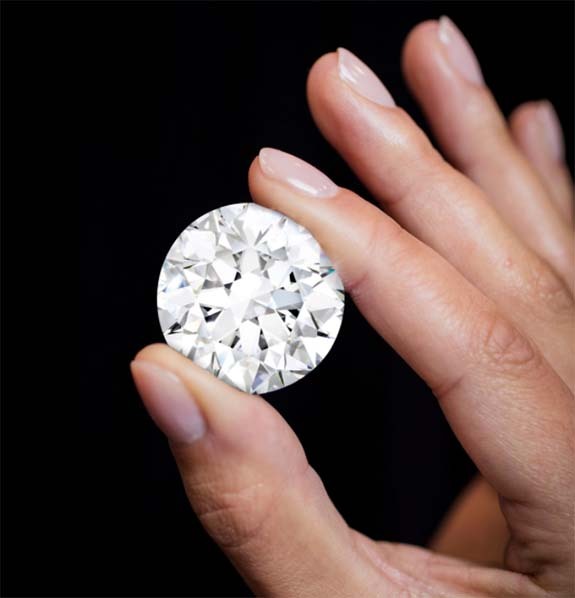 Sotheby's London Salon is offering for sale the world's largest D-flawless round brilliant-cut diamond. At 102.34 carats, the impeccable stone is being hailed as the rarest white diamond ever to come to market, and Sotheby's is confident it will break a world record for the highest price ever paid for a D-flawless. The diamond is expected to fetch more than $34 million. Sotheby's emphasized that while only seven D-flawless diamonds weighing more than 100 carats have ever sold at auction, none were round brilliant cuts. The lack of rounds is really a matter of dollars and cents. When working with extraordinarily large rough stones, cutters generally opt for elongated cushions, emerald cuts, and pear shapes, which allow them to keep the maximum carat weight. Sourced in Botswana by De Beers, the 102.34-carat polished gem was cut from a rough diamond weighing 425 carats. The cutting and polishing process was conducted by Diacore's most experienced artisans in Johannesburg and New York and took six painstaking months to complete. Although 24 other finished gems would be extracted from the rough, the round primary stone accounted for only 24.1% of the total weight. By comparison, the 163-carat stunner known as “Art of de Grisogono” was honed from an Angolan-sourced rough diamond that weighed 404 carats. The emerald-cut primary gem accounted for 40.3% of the total weight. The D-flawless “Art of de Grisogono” fetched $33.7 million at Christie’s Geneva in November of 2017 and currently holds the record for the most expensive D-flawless diamond. While a great majority of its high-profile gemstones are offered at auction, Sotheby's will be selling the flawless round through the Sotheby's Diamond retail boutique on New Bond Street in London. The diamond was on public display last week and will be available for private viewings through February 16. A Sotheby's spokesperson told JCKOnline.com that she expects the stone's selling price to "greatly exceed" the current record. 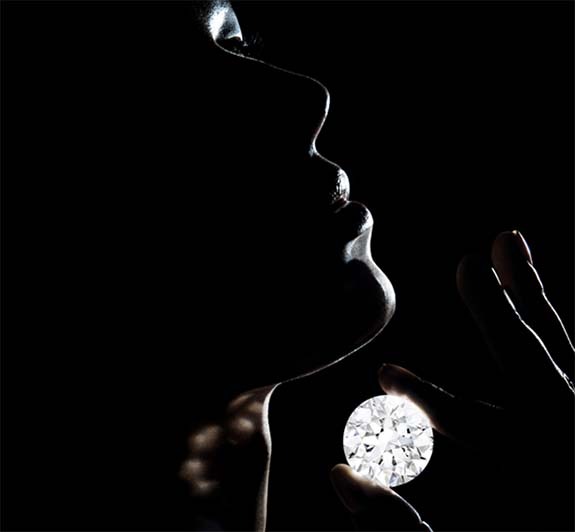 "This stone is over 100 carats of flawless perfection," said Patti Wong, Founder and Chairman of Sotheby’s Diamonds. 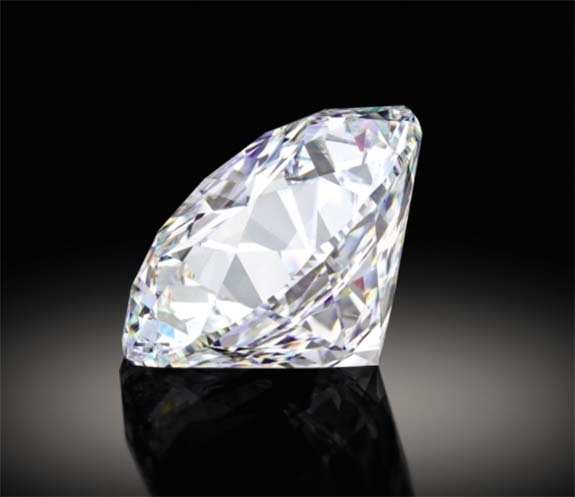 "In the course of my long career, which has brought me close to some of the greatest stones the earth has ever yielded, I have not encountered anything quite like this.” Sotheby's noted that beyond the stone's exceptional color, size, clarity, cut and symmetry, it is also rated Type IIa by the Gemological Institute of America. Diamonds in this rare and coveted subgroup are chemically pure and often show extraordinary optical transparency. Credits: Images courtesy of Sotheby's. Sotheby’s London Salon is offering for sale the world’s largest D-flawless round brilliant-cut diamond. At 102.34 carats, the impeccable stone is being hailed as the rarest white diamond ever to come to market, and Sotheby’s is confident it will break a world record for the highest price ever paid for a D-flawless. The diamond is expected to fetch more than $34 million. Sotheby’s emphasized that while only seven D-flawless diamonds weighing more than 100 carats have ever sold at auction, none were round brilliant cuts. The lack of rounds is really a matter of dollars and cents. When working with extraordinarily large rough stones, cutters generally opt for elongated cushions, emerald cuts, and pear shapes, which allow them to keep the maximum carat weight. Sourced in Botswana by De Beers, the 102.34-carat polished gem was cut from a rough diamond weighing 425 carats. The cutting and polishing process was conducted by Diacore’s most experienced artisans in Johannesburg and New York and took six painstaking months to complete. Although 24 other finished gems would be extracted from the rough, the round primary stone accounted for only 24.1% of the total weight. While a great majority of its high-profile gemstones are offered at auction, Sotheby’s will be selling the flawless round through the Sotheby’s Diamond retail boutique on New Bond Street in London. The diamond was on public display last week and will be available for private viewings through February 16. A Sotheby’s spokesperson told JCKOnline.com that she expects the stone’s selling price to “greatly exceed” the current record. Sotheby’s noted that beyond the stone’s exceptional color, size, clarity, cut and symmetry, it is also rated Type IIa by the Gemological Institute of America. Diamonds in this rare and coveted subgroup are chemically pure and often show extraordinary optical transparency.